Rabbits can be perfectly happy living in the house or the garden just so long as their physical and behavioural needs are catered for. This means that they need a lot more than just a hutch! Our recommendation for pair of average size rabbits is an overall area of 10 ft x 6 ft with a run height of 3ft, or in metric, 3m x 2m and a run height of 1m. Just as with a healthy diet, a rabbit’s environment has a huge influence on its health and well being. A caged rabbit can develop skeletal problems, sores and is more likely to be overweight. Check our note on environment and health by Specialist vet Richard Saunders. If you choose a traditional hutch as a bedroom for your rabbits, it needs to be big enough for a rabbit to take 3 hops and to stretch fully upright. For most breeds this will mean a hutch of 6ft long x 2ft tall, so we recommend a hutch no smaller than 6ft x 2ft x2ft, with an attached exercise run of 8ft long, 6ft wide and 3ft tall. An 8ft run sounds very large, but in reality this is only going to allow your rabbits 4 hops on average. But you don’t have to go for a hutch and run – more rabbit owners are being creative to give their rabbits the home of their dreams. Garden sheds can be converted, for example. Rabbits are active animals, and can develop painful skeletal problems if kept permanently caged so daily exercise outside the hutch is vital. A hutch should only ever be a shelter, never the sole or main accommodation for your rabbits. For this reason we recommend a large hutch or shed with an exercise run permanently attached. This means that the rabbits can decide when they want to shelter, and when to play. Rabbits are “crespuscular” which means they are most active at dawn and dusk – so lifting them from hutch to run for a few hours in the daytime just doesn’t suit their body clocks and instincts. Having the hutch and run permanently attached also means you can have a Sunday morning lie-in without feeling guilty! The enclosure must be secure. If it’s outside then it has to keep out foxes and other predators so the mesh and bolts must be of a good quality. Go for welded mesh of a heavy gauge, not chicken wire, which they can bite through. Use a bolt you can padlock. Give a lot of thought to the wire. There is a gauging system for thickness of wire and the lower the number, the thicker the wire. 16g (1.2mm) is the minimum we recommend. And 12g is even better. Ensure that the wire is properly fixed to the wood. If it’s a single layer of wire it is safer to be attached on the inside of the run rather than the outside. The size of the holes in the wire is important. 13mm is perfect, but most commercially produced enclosures will have a 25mm gap. This will keep out foxes and rats but not smaller predators. Stoats, polecats and weasels are a danger to rabbits, with weasels being the smallest. If these are concern, either build an enclosure yourself with 13mm mesh, or add another layer of mesh to the outside of the existing frame. Be aware of some exercise runs that have caused death or injury to the rabbits who have got their heads stuck in the mesh. Always read the reviews! The staples that hold the wire to the wood must be as strong as possible so go for the sturdiest you can find. The enclosure should be out of direct sunlight and at least partially covered to protect your rabbits from the elements. Run covers are available commercially and tarpaulin can be bought quite cheaply from garden centres. Rabbits whose exercise run is on a lawn will enjoy access to grass every day, which is great for their teeth and digestive systems and will keep them busy. Recent research also shows that rabbits on grass are less likely to suffer from sore heels. But be aware that unless you take appropriate precautions, they are likely to dig their way out, which could put them at risk from predators. So, if you have your run on grass, either make sure you move or fill it it regularly, fit a wire-mesh skirt, or place paving slabs around the perimeter to slow them down and make it more difficult for your rabbits to tunnel out. Rabbits with enclosures on concrete, slabs or decking (or in grass runs with a wire mesh skirt around the perimeter) will not be able to dig out, making them more secure. But because digging is a natural behaviour, you will need to provide them with an alternative: a digging pit, which could be a large litter tray or planter filled with earth. This will need to be changed regularly. They will also need a hay rack to give them access to hay that hasn’t got wet from the ground – and also to encourage them to stretch up. Most rabbits will chew on hutches or runs. Make sure the wood hasn’t been treated with something toxic. Modern paints are safer than older ones but ideally they shouldn’t eat it. If you are treating the wood with a timber preservative, ensure it’s safe for pets and has dried and been sanded before your rabbits get near it. If their chewing is making a hutch or run start to fall apart, there is a danger of them getting out, or of predators getting in. Keep all housing in good repair. Weedkillers, slug pellets, fertilisers and various other chemicals found in many gardens are toxic to rabbits, very many of them deadly. Keep them locked safely away, or better still investigate some ‘green’ methods of gardening that don’t involve poisons. For example, instead of slug pellets, which kill anything why not use slug nematodes? They are for sale on several gardening websites and are safe for all other species, including rabbits, humans, garden birds, frogs, fish and your other pets. Enrichment is what rabbits need to be able to act like rabbits. If your rabbits are on concrete or indoors then they will need a digging tray. They will also need hidey holes, tunnels and will benefit from a hanging hay rack which allows them to stretch as well as preventing hay from being soiled on the ground. 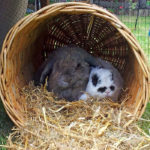 Check out our enrichment advice for some great ideas to keep your rabbits occupied and content. This set up has everything in it that the rabbits would need. The shed is converted. There are 2 bolts on the door, top and bottom for extra security. We have used 12g 13mm wire attached by strong galvanised wire staples. There is a felt roof for protection and there is wire sunk under the grass area. There are 2 holes for entrance / exit between the shed and the exercise area. Plenty of space to run, jump and binky. In the wild, rabbits live in underground warrens where the temperature does not vary much between winter and summer. We need to bear this in mind for pet rabbits. The sleeping area should always be warm, dry and draft free. There are lots of good bedding materials on the market now such as Megazorb and Auboise. Straw is warmer than hay in winter, but make sure you get soft, dust extracted bedding straw so that you minimize the risk of eye injuries and avoid a dusty environment. If you do use hay they are more likely to eat it so make sure you keep it topped up, and again, make sure it is fresh and dust free. And of course because they have a companion they will each have the equivalent of a furry hot water bottle next to them! Follow RWAF’s board Outdoor Rabbit Housing on Pinterest.